^ Constantine I (306–337 AD) 页面存档备份，存于互联网档案馆 by Hans A. Pohlsander. De Imperatoribus Romanis. Written 2004-1-8. Retrieved 2007-3-20. ^ 2.0 2.1 2.2 2.3 2.4 Taagepera, Rein. Size and Duration of Empires: Growth-Decline Curves, 600 B.C. to 600 A.D.. Social Science History (Duke University Press). 1979, 3 (3/4): 125. JSTOR 1170959. doi:10.2307/1170959. 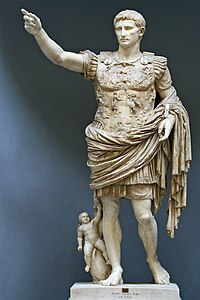 ^ Roman Empire – Britannica Online Encyclopedia. www.britannica.com. [2008-07-09]. （原始内容存档于2008-08-20）. ^ Kremer, M. Population Growth and Technological Change: One Million B.C. To 1990 (PDF). The Quarterly Journal of Economics. 1993, 108 (3): 681–716 [2017-03-15]. JSTOR 2118405. doi:10.2307/2118405. （原始内容存档 (PDF)于2017-01-13）. ^ Breasted, J.H. Ancient Times a History of the Early World. Рипол Классик. p. 675. ISBN 117400312X. ^ Christopher Kelly, The Roman Empire: A Very Short Introduction (Oxford University Press, 2006), p. 4ff. ; Claude Nicolet, Space, Geography, and Politics in the Early Roman Empire (University of Michigan Press, 1991, originally published in French 1988), pp. 1, 15; T. Corey Brennan, The Praetorship in the Roman Republic (Oxford University Press, 2000), p. 605 et passim; Clifford Ando, "From Republic to Empire," in The Oxford Handbook of Social Relations in the Roman World (Oxford University Press, pp. 39–40. ^ Clifford Ando, "The Administration of the Provinces," in A Companion to the Roman Empire (Blackwell, 2010), p. 179. 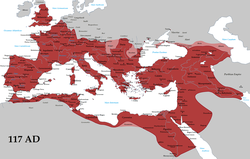 ^ Nicolet, Space, Geography, and Politics in the Early Roman Empire, pp. 1, 15; Olivier Hekster and Ted Kaizer, preface to Frontiers in the Roman World. Proceedings of the Ninth Workshop of the International Network Impact of Empire (Durham, 16–19 April 2009) (Brill, 2011), p. viii; Andrew Lintott, The Constitution of the Roman Republic (Oxford University Press, 1999), p. 114; W. Eder, "The Augustan Principate as Binding Link," in Between Republic and Empire (University of California Press, 1993), p. 98. ^ John Richardson, "Fines provinciae," in Frontiers in the Roman World, p. 10. ^ Richardson, "Fines provinciae," in Frontiers in the Roman World, pp. 1–2. ^ Mary T. Boatwright, Hadrian and the Cities of the Roman Empire (Princeton University Press, 2000), p. 4. ^ Yaron Z. Eliav, "Jews and Judaism 70–429 CE," in A Companion to the Roman Empire (Blackwell, 2010), p. 571. ^ Adrian Goldsworth, How Rome Fell: Death of a Superpower (Yale University Press, 2009), pp. 405–415.